Below you will find a sampling from Red Lion's video library. We invite you to visit our YouTube channel for full access to video and webcast content. Automation World's Director of Content/Editor-in-Chief David Greenfield joins Mike Granby, president of Red Lion Controls, to discuss how to make the vision of the connected factory a reality by using industrial solutions that thrive in environments where automation products from multiple vendors exist side by side.This webcast interview focuses on cost-effective ways to seamlessly connect, monitor and control assets without starting from scratch. Kaizen, lean manufacturing, six-sigma, total quality management and continuous improvement; all of these terms refer, in some form or another, to the efforts of companies as they strive to become more competitive in a global economy. While various strategies are implemented in order to improve productivity, they have two things in common: the collection and communication of key performance indicators (KPIs). This webcast serves as an introduction to the concept of visual management, and how it increases efficiency and reduces downtime. 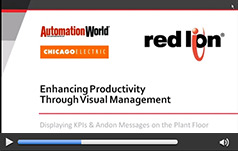 Red Lion and Chicago Electric join together to discuss the real-world benefits of collecting and displaying KPIs and Andon messages on the plant floor. Equipment and implementation costs aren’t the only items to consider when designing wind farm networks. Proper network planning is essential for building high-speed, industrial-grade infrastructures that improve performance and maximize uptime. 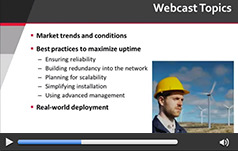 This webcast discusses industry best practices and presents real-world deployment examples. As wind farms continue to sprout worldwide, networking technology is a key component to keeping wind farms up and running at peak efficiency. An important part of the technologically-savvy wind farm is industrial-grade Ethernet, which has evolved to combine rugged networking with reliable performance and advanced features. 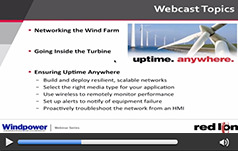 This webcast provides an insider's look at how industrial switches are being used with automation equipment to maximize wind farm uptime. Today's utilities operate in a regulated business environment that needs to comply with many stringent requirements. Mounting pressures are moving utilities to build high-availability smart sites that help minimize unscheduled downtime and allow for shorter time to repair. 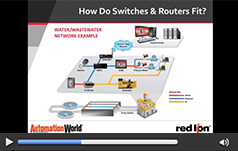 This webcast explains how the integration of wireless communication and cellular automation enables cost-effective monitoring and control of data at remote sites.